Always make sure the green light is on before exiting the aircraft. Quick! What do you do if you are on jump run, the green light has been turned on, and then the green light goes out (either the red light comes back on or the green light simply turns off)? Assume the light is broken and proceed with your climbout and skydive. Flip the spotting switch left and right quickly to let the pilot know the light is out, then climb out and exit after waiting the appropriate amount of time after the group ahead of you. Abort your climbout, help any jumpers who have already climbed out to get back in, then look for an explanation/further instructions from the pilot. If jumpers are already floating outside the aircraft, that group should continue their climbout and exit, but later groups should not climb out and they should await further instructions from the pilot. You’re supposed to look at the light before exit?! In an aircraft full of skydivers standing up and moving around as they prepare to exit, the door and exit lights are the quickest, simplest ways for the pilot to communicate with jumpers by the door. At Spaceland we have the red light to tell us to open the door and check for spot and traffic, and green light when the pilot says it’s OK to exit. If that green light goes dark and/or the red light comes on, the following groups should not exit! The pilot is telling you that he or she believes it is no longer safe to exit. The problem could be clouds, a spot that’s getting too long, or even an air traffic problem such as another aircraft flying into our jump airspace. Yes, we are in fairly highly controlled airspace here, but that does not mean that all pilots talk to air traffic control regularly when flying or respond as quickly as desired if ATC tells them to change course to avoid us. This is even more true in less controlled airspace than ours. I hope you answered #4 above! If the green light goes dark and/or the red light comes on, if jumpers are already floating outside the aircraft, that group should continue their climbout and exit, but later groups should not climb out and they should await further instructions from the pilot. 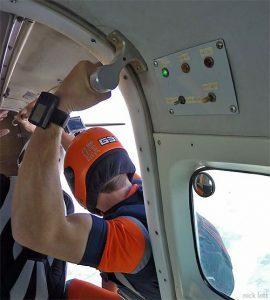 Once climbouts have stopped, close the door to reduce noise and communicate with the pilot to discover the reason for the aborted jump run and what will happen next. The pilot will either look back to communicate with the first group out directly or pass that communication on to an instructor or experienced jumper up front to relay to the first group out. Jumpers not essential to that line of communication should sit back against the walls and stay quiet until communication is complete. The pilot has more information about weather and other aircraft than the jumpers in the back, so for everyone’s safety we need to be aware of this vital communication from him/her and respond accordingly.